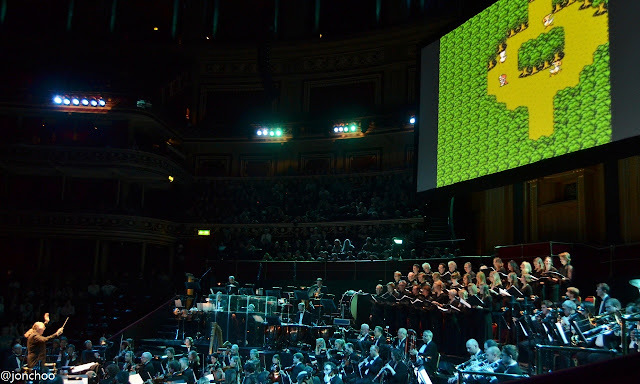 The Royal Albert Hall hosted the first of this season's Distant Worlds: Final Fantasy orchestra, a worldwide event celebrating the 25th anniversary of the series. The first game was released in Japan on 18 December 1987 by Square on the Famicom (NES) platform, popularising the RPG genre. Since then, 13 main numbered games within the series has also been released, including various none-numbered spin-offs and sequels. The next game in the numbered series would be Lightning Returns: Final Fantasy XIII and is a further sequel to Final Fantasy XIII. It was a great evening, and I have always enjoyed concerts at the Royal Albert Hall. The famous Kensington venue, while traditional in architecture, seems apt for a wide range of performance styles and music genres. In fact, the last time we were there was last year for the BBC Radio 3's Big Red Nose Snow and, before that the Cirque Du Solei's Totem (thanks London Midland!) circus! Anyway the conductor Arnie Roth and the Royal Philharmonic Orchestra managed to sneak in at least a track from each numbered Final Fantasy game, with the first three main titles having to make do with a medley, though I was disappointed there were nothing from Final Fantasy Tactics (aka: one of the best SRPG of all time). Hitoshi Sakimoto deserves more than this (I mean, go listen to his stuff on Vagrant Story, Ogre Battle, Valkyria Chronicles, etc. well his entire repertoire really!). Well, at least they covered "The Dalmasca Estersand" from Final Fantasy XII, (aka second best goddamn Final Fantasy after VI). All in all, we had a good night. I admit I am not the biggest fan of every Final Fantasy games, but it was nice to hear their music being played live, and by the Royal Philharmonic Orchestra no less. Distant Worlds is also available as an album.